When considering a move to Office 365, organizations must be aware of several significant risks to their email infrastructure. The cloud may seem like a simple, cost-effective alternative to on-premises email, but continuity and security issues cannot be overlooked. 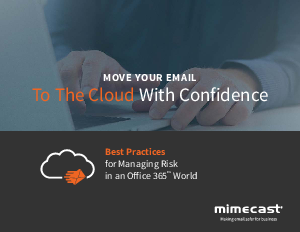 Download our E-book, “Move Your Email to the Cloud with Confidence: Best Practices for Managing Risk in an Office 365 World,” to learn more about how to avoid cloud email headaches.